How Real are Hot Streaks in Golf? Whenever a golfer goes on a high profile hot streak – think Rickie Fowler since June, Billy Horschel for the FedEx Playoffs, Henrik Stenson at the end of last year – there’s always a ton of talk in the media and among fans about how their new swing/putting stroke finally clicked, or that player is returning to form, or they’re finally mature enough to win, etc. Humans love writing narratives to explain why things happen. The end result of all that talk is that a guy in the middle of a hot streak is considered to be much better than they would’ve been considered before the hot streak. No one thought Billy Horschel was deserving of a Ryder Cup pick a month ago, but now everyone thinks we should toss Webb/Mahan off to make room for him. No one thought Rickie Fowler was one of the 1-2 best American players in May, but now that’s almost assumed. Everyone around golf seems to think that hot streaks are real – that they actually predict who’s going to continue to play well. In this post I’ll provide evidence that shows that hot streaks are retained to a small degree – even months later – but that extreme performances still regress strongly to prior expectations. 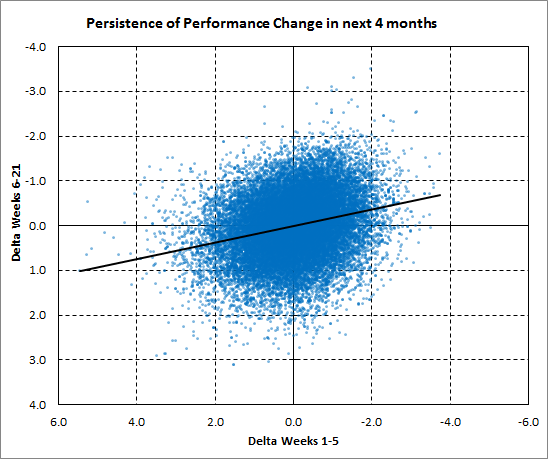 I settled on using five week periods to measure performance. My sample was everyone who had recorded at least 8 rounds in a five week period and then recorded at least 8 rounds in the next five weeks. All my data is from the 2011-2014 seasons. The actual metric I used to measure performance was my z-score ratings, which are basically strokes better or worse than the field adjusted for the strength of the field. I compared each player’s z-score over that five week sample to my prior z-score rating. I have a prior rating for every player in my sample generated each week which mostly uses prior performance and very recent play to predict how well a player will play that week. They’re designed to be the most accurate prediction of performance. 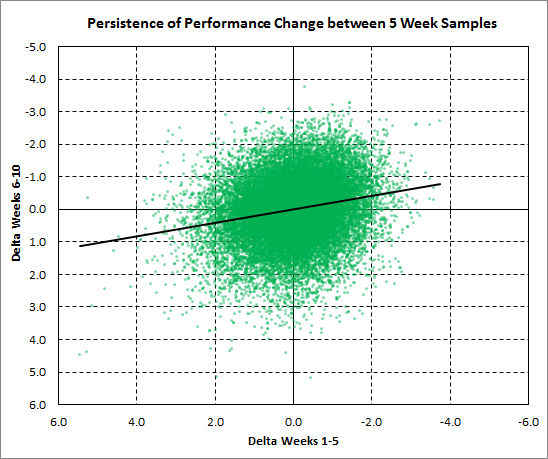 I subtract the prior expectation from the sample performance to get the change in performance which I’ll call the Initial Delta. I generated an Initial Delta for every player who qualified for my sample, generating over 27000 separate data points. I then calculated a Subsequent Delta for every player using the same method only using the next five weeks as my Sample performance and the same Prior expectation used above (meaning I don’t consider any recent results). I then compare the Initial Delta to the Subsequent Delta. If players get hot and stay hot, the two should be strongly correlated. If whether a player has been hot or cold does not predict their subsequent performance, the two will not be correlated. tl;dr of the above is I’m comparing how much better/worse a guy played over the first 5 or 10 weeks to how much better/worse he played over the next 5 weeks. The results show that in general players retain only a small portion of their over or under-performance. Overall, about 20% of the Initial Delta is retained over the next five weeks. This means that if Billy Horschel played 1.8 strokes better than expected over the last five weeks, he should be expected to play about 0.36 strokes better than previously expected in the next five weeks. Now, 0.36 strokes is a large amount, but it’s not enough to bring him up to Bubba/Fowler/Keegan’s level (here is an example of the distribution of talent among the top 50 in the world). Right now, he should be considered slightly better than Mahan or Webb, but not to some ridiculous amount and certainly not to any degree that’s going to effect the outcome of the Cup. The above shows that hot streaks can be retained to some degree over a short period of time, but how much is retained further down the road? Is Billy Horschel going to be able to retain any of that ability he showed to win the FedEx Cup going into next season? I set-up the same study as above, only instead of looking at performance in the next five weeks, I looked over the next four months (16 weeks to be precise). Everything is calculated the same, though I only included players with at least 20 rounds over that four month span. The results here showed that about 18% of the Initial Delta is retained over the next four months, a similar amount to what is retained over the next five weeks. Golfers who play significantly better than expected over five weeks should perform better than previously expected, but only to a small degree. To give you a sense of when recent performance becomes mostly insignificant, if a player performs 0.5 strokes better than expected over five weeks (basically what Chris Kirk has done in the FedEx Cup Playoffs), he is expected to retain only around 0.1 strokes (which is insignificant, basically a rounding error in predictive terms). 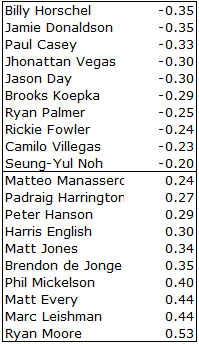 I’ve attached a list of the top and bottom ten guys who have most over or under-performed over the last five weeks (PGA/European Tour only). Obviously Horschel is at the top along with some FedEx Playoff stalwarts like Palmer/Fowler/Day. Ryder Cupper Jamie Donaldson has been killing it over in Europe as well. Among the trailers, Phil’s name sticks out like a sore thumb. The US team has to hope his multiple weeks off can help him rediscover his game before the next week. Probably the most terrifying thing is how close Ryan Moore came to making this team – he finished 11th in points, but was only a stroke away from jumping Zach Johnson in points at the PGA Championship. Moore is dead last of 339 pro golfers in terms of his performance relative to expectation. not sure I have the math to really get you here. I’ll give it another pass, see if anything sinks in. But the thing is, when a golfer’s game is cresting, it’s because he or she has found a move, they’re following a feeling that brings their swing around towards perfection. Thing is though, they follow that feeling right through the peak and follow it down the other side again, until a new idea or a new move, a new drill swings them back towards perfection again. My guess is that if they could know it, if they could change the feeling they’re following at the top of the crest, they could stay in the zone. There’s probably a lot of psychology around it, it must be impossible to sense the top of the crest, and extremely difficult to implement a change that is the opposite of the one that has brought them their so-recent success . . . I expect that’s exactly why we don’t see that much carry-over of hot streaks. I view it like this: a golfer has a level of talent based on their physical ability, swing, mental game, strategy, etc. Then they vary around that level of talent based on the micro level stuff you’re talking about – mindset that week, a certain drill that clicks on the range, etc. I’ve seen this in some unpublished research I’ve done; you can tell which players will play a bit better or worse over the weekend just based on the first round. That’s not surprising necessarily, but it supports your idea that guys find something that clicks on Wednesday and they carry it over the weekend. The only problem is it seems based on all the research I’ve done that the micro level stuff is very fleeting. It’s difficult to carry it into next weekend, three weeks down the road, four months later, etc. Hmm . . . I kinda thought of it in terms of more that one week, somewhere upwards of three . . . like Horschel’s run at the end of the year, or Garcia’s good runs over the years – maybe the magic Nelson streak . . .
but I guess your one-tournament thing is real too, what else could describe the many times Mel Fickleson (Lefty – a friend’s joke) has suddenly shown up after giving no sign at all? Plus, I guess, like the Haney commercial lately, these guys have a plan, and probably rarely change the feeling they’re chasing during a single tournament, so Thursday would be the best indicator, that makes sense. This is fun to talk about, thanks. Hey, speaking of – can we talk about Haney? Well, Horschel’s run was driven by different aspects of his game every week. At the Deutsche Bank his tee to green game was great, putting solid. At the BMW his tee to green game was mediocre, putting otherwordly. At East Lake his tee to green game was again very good, putting good enough. So if he really found something with his swing at the Deutsche Bank, it definitely didn’t carry over the next week, but magically reappeared at East Lake.